Product prices and availability are accurate as of 2019-04-21 11:58:01 EDT and are subject to change. Any price and availability information displayed on http://www.amazon.com/ at the time of purchase will apply to the purchase of this product. The Lake George 54 in. LED Indoor/Outdoor Natural Iron Ceiling Fan from Home Decorators Collection will complement a wide range of decor with its natural iron finish and walnut finished blades. 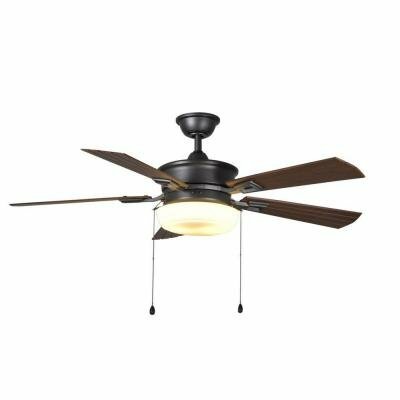 This ceiling fan refreshes large indoor and outdoor spaces and features three-speed pull-chain control with reverse functionality. Its blades are weather resistant and its housing is wet-rated for durability in open applications. An integral dome-style 2-light kit with frosted opal glass provides bright illumination that will add ambiance to any area. Installation on included downrod has a height of 16.25 in. and if installed as a flushmount it has a height of 11.75 in.